I still remember my first GF grocery adventure. I wrote down a list of ingredients that were to be avoided on a 3×5 card and struck out on my own. My normal 30 minute jaunt around the store seemed to drag on for ever. Each label seemed to take about 5 minutes to read and understand. 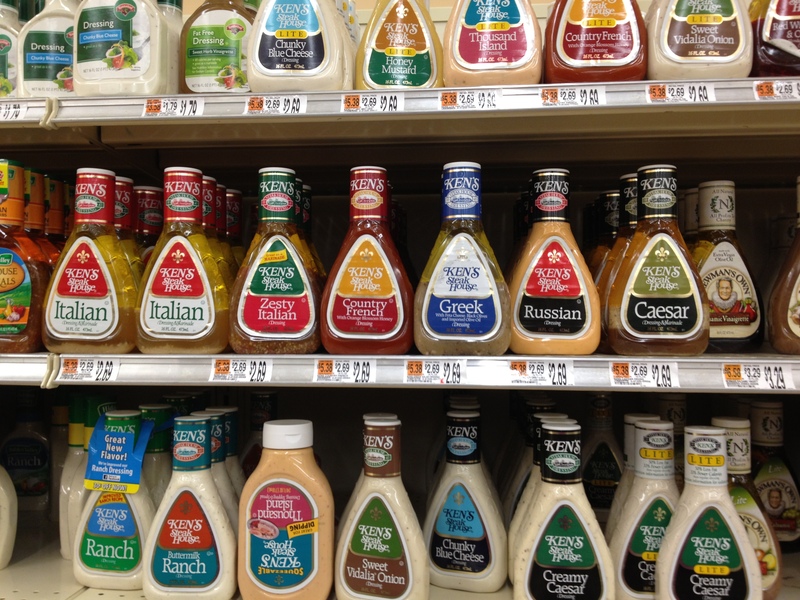 Of course, since then, labeling has improved and GF selection has expanded. But remembering the stress of those first few trips to the store, I offered to tag along with my friend and his wife for their first GF grocery adventure (still waiting for them to take me up on it). In the meantime, I had them in my head when I hit Hannaford’s this weekend. My iPhone helped me document my favorite GF items around the store in an effort to make a quick and easy shopping guide. Next time I’ll try for Healthy Living and City Market. What are you favorites? What would you recommend to your friend going gluten-free? 1. 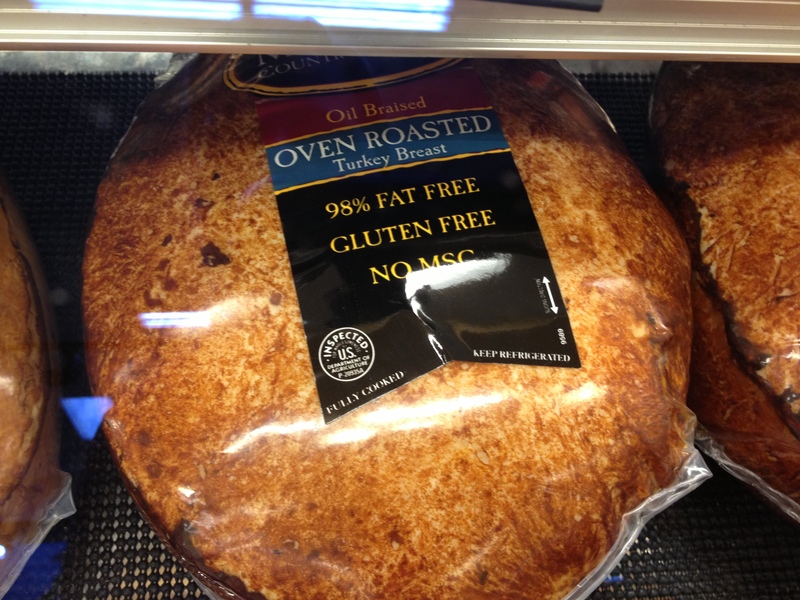 You may experience sticker-shock for items that are gluten-free “speciality” items, like bread. 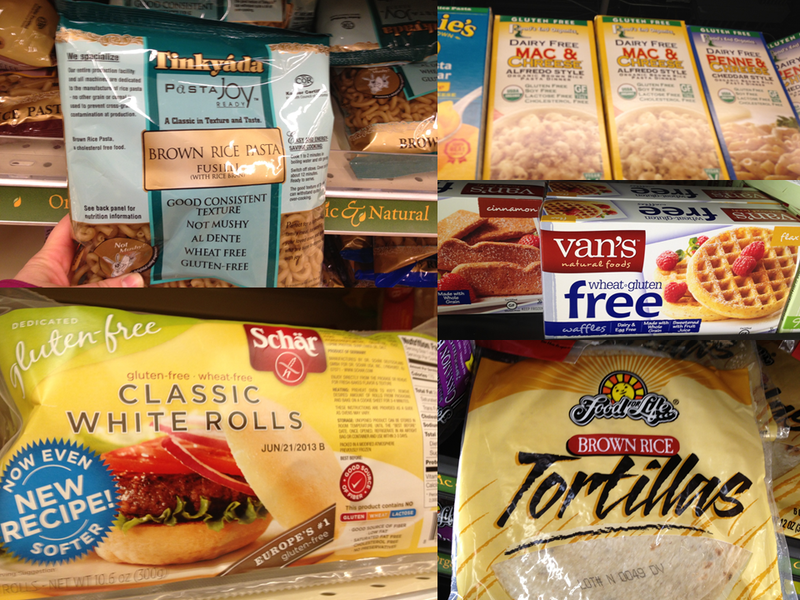 Items that are naturally gluten-free are just their normal price. 2. When in doubt, go without. Noticeably missing from Hannaford’s is GF Brown Rice Crispies (yes, you can make GF rice crispy treats with these!). Rice Chex harkens back to my childhood. It’s also a good one to keep in mind when you are traveling, as sometimes its offered at hotel buffets in little single serving containers. Barbara’s Puffins has finally gotten themselves straightened out to offer a truly gluten-free option. It’s pretty good if you like Puffins. I enjoy Puffins and Rice Chex because they are “normal” cereals. Next, Hannafords has some large bags of GF corn flakes and Mesa Sunrise (corn flakes with flax and other good stuff mixed in). Pretty good deal for the quantity. There are plenty of GF granolas on the market. PErsonally, I think granola should be made of oats, not nuts and corn flakes, so I like the Kind brands. There’s a huge selection of Kind granolas at Hannafords. 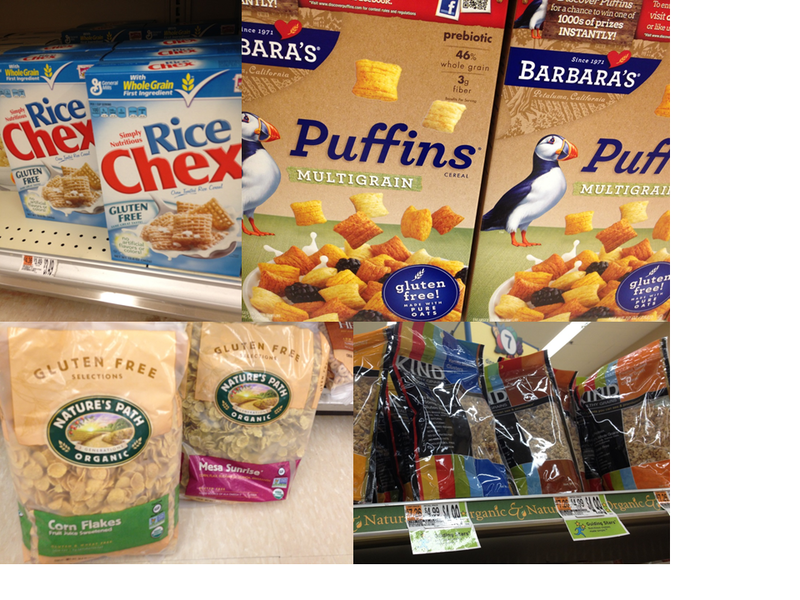 Note that all of these items are in the regular cereal aisle, not the GF aisle! 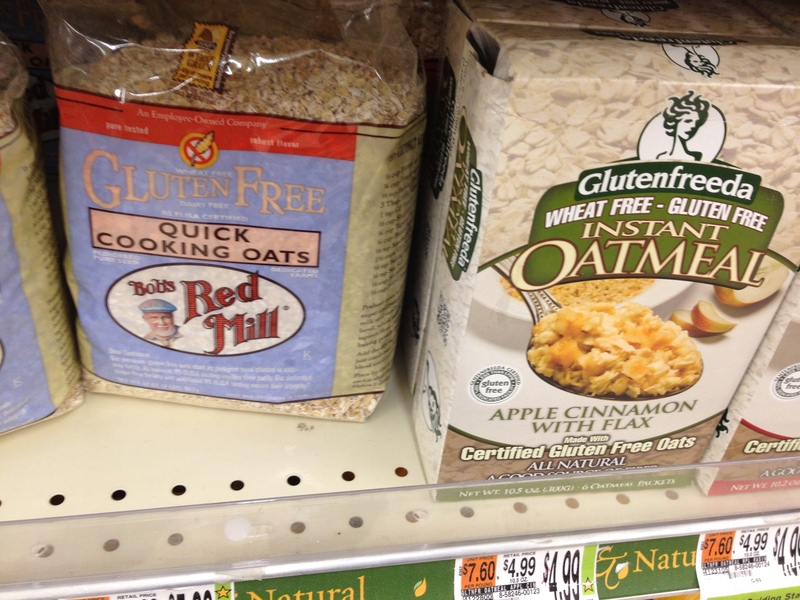 GF goes mainstream 😉 Over in the GF aisle, you will find the GF oatmeal. I find that the Bob’s Red Mill doesn’t cook up quite as “quick” as I would like but I’ve found a way around that. I often take the Glutenfreeda instant oatmeal packets with me on the road, as even if GF breakfast options are sparse you can always find some hot water and a cup. Every bunny deserves a treat! 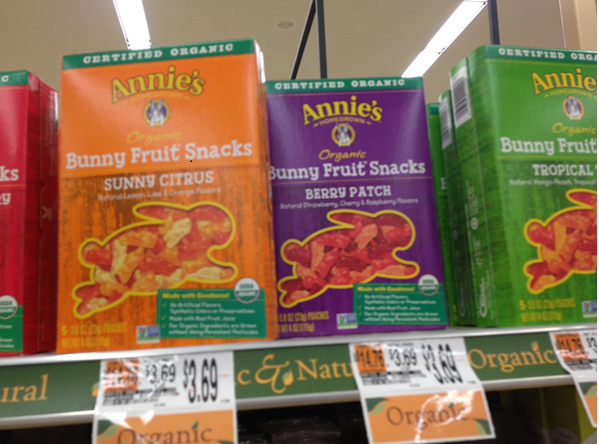 Annie’s bunny fruit snacks are GF. I don’t have kids but I imagine this is a winner with the little ones. course! Remember, just because its GF doesn’t mean it’s healthy. Sometimes the oils and sugars added to make up for the gluten makes GF higher in calories!). Almond horns, simply delicious– hard but soft, sweet but not sugary. Glutino cookies– just like oreos! (almost) and great for crusts of ice cream cakes. Lucy’s are a sure winner, every time. Crisp cookies but yummy in every flavor. Hannafords also has some frozen GF treats, which I haven’t tried but recognize some very reliable brands, like Udi’s. Perhaps handy if you need to grab GF cupcakes or muffins in a hurry (as long as you have time for them to defrost?). These are in a small freezer section in the bakery. If sauce were a food group, it might be my favorite. 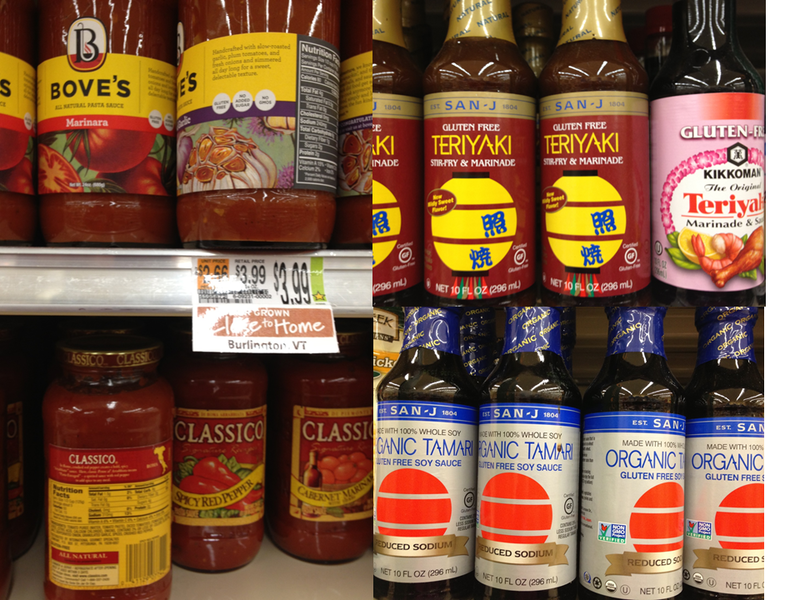 Hannaford’s has GF soy sauce and some other Asian cooking sauces lined up with the regular ol’ sauces. This market has expanded A LOT in the last few years– evident by Kikkoman even joining the wagon. Tomato sauce is tricky– remember that wheat is sometimes found in tomato paste. I go for tomato sauce that clearly states it is GF or where I can fully understand the ingredients Bove’s and Classico both label their GF sauces and are conveniently located next to each other in the sauce aisle, just waiting for me to snap a nice pic. 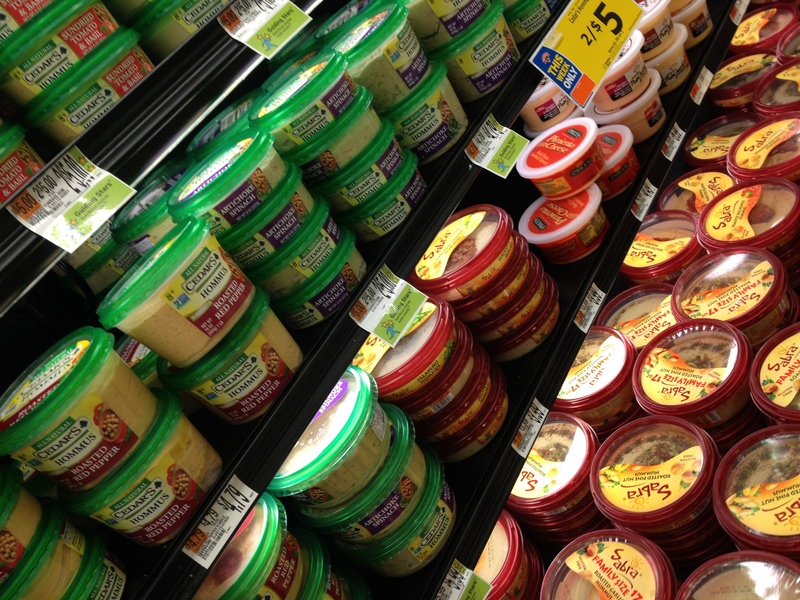 I haven’t met a hummus that isn’t GF (but still I read all the labels). Other condiments sometimes have surprise gluten in them– you think they don’t but it’s good to double-check. For example, Newman’s Own Balsamic Vinaigrette has soy sauce with wheat in it. What! Yes! Tragic. I believe all of the Ken’s brand dressings are GF, but always double-check the label. Before you head to the GF aisle, check out the cracker aisle. There you will find Nut-thins, which are a mix of nut flours and rice flour. They’re pretty yummy! Also in this aisle, you will find Asian rice crackers– make sure you buy the ones that are GF, as some have soy sauce with wheat. 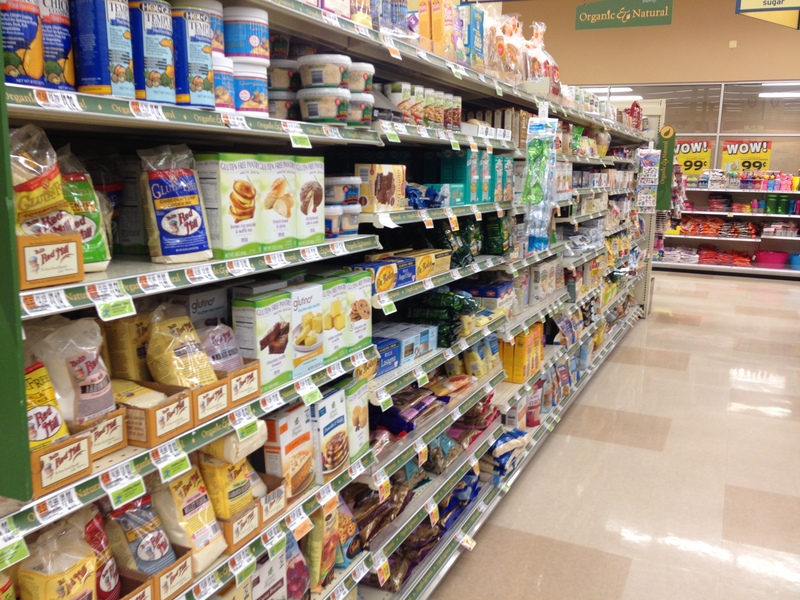 There’s also rice cakes in this section. Personally, I only by the rice cakes that say GF on them but feel free to be only as paranoid as you want. 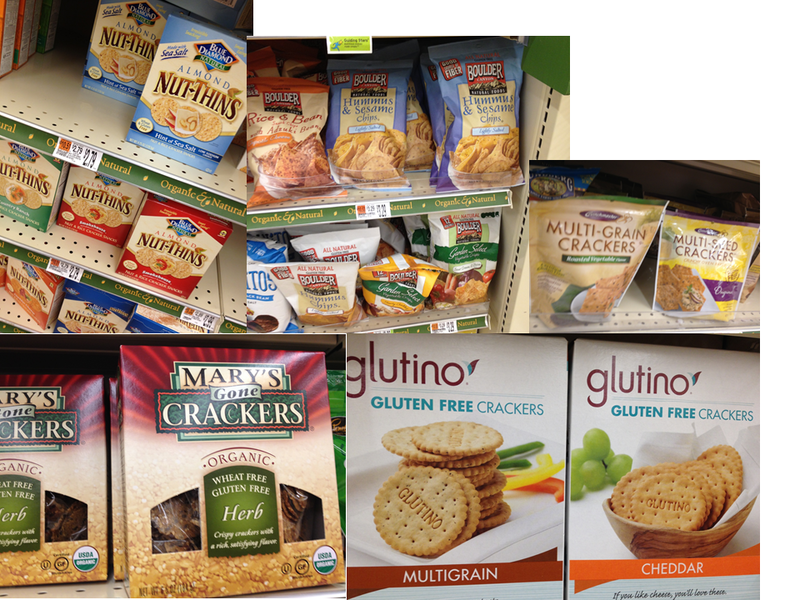 Moving into the GF aisle, you’ll find my favorite GF “bird food” cracker– Mary’s Gone Crackers. I like Herb or Caraway some people like them plain. Either way, you will feel virtuous for eating these super healthy crackers. Glutino makes the best “your friends won’t know its GF cracker.” Somewhere between a Ritz and a table cracker, they are a great all-purpose cracker. I like the CrunchMaster Multi-Grain crackers paired with cheese or to go with a salad for lunch. They are a little less bird-food like than Mary’s, but still hearty and healthy. If you fancy a chip, know that most corn tortilla chips are gluten free. Many potato chips are gluten free. Start paying more attention to the ingredients if you eat flavored chips or go for brands like Kettle Chips that are GF. New on the market are Boulder Canyon chips. They’ve done some interesting things, like use chickpea flour for air-popped chips. Worth trying out! GF whole grains are of course the best gf options for your daily diet. Rice has had some controversy lately, so use it once a week or so. Quinoa is my personal favorite, so delicious and nutritious. Follow the instructions on the package or cheat like me and use your rice cooker. I’ll throw in some broth instead of all water, maybe some herbs or spices, perhaps some chopped veggies. Cook it up and you’re good to go. Great leftover and cold (unlike rice). Sometimes though, you just want a sandwich. Or pasta. At Hannaford;s, here are my recommendations. Schar makes great buns, rolls, etc. They are parbaked so you can toast them at home. They are pretty low calorie, particularly compared to their gluten-heavy counterparts. Brown rice tortillas are great for open-faced tostadas or grilled quesadillas. Keep them frozen until use, as they break easily. They make ok wraps for sandwiches but I would recommend wrapping them in a towel and then a bag to keep the wrap moist (they crack when they get dried out). Gluten-free toaster waffles should go in a breakfast section. One of these is like a piece of toast and generally yummier than GF bread, I think. Make sure they stay frozen or they tend to crumble. I’ve been known to toast up a BLT with cheve on two toaster waffles. Genius or weird, you decide. I started out using Pamela’s Baking & Pancake Mix for EVERYTHING. My Gramma Ginnie’s brownies. Pancakes. Banana Bread. Dredging chicken before cooking. It is still my go-to. Note that it does have almond flour in there so it’s not right for everyone. Another good option is King Arthur’s GF flour mix. I’ve also had really good results substituting that 1:1 for regular flour in recipes. Both are in the GF aisle at Hannaford’s. I’ve had some flour mixes or other mixes (like for breads, pies, etc) that were real flops so I’m leery to try new things. If you’re just starting out baking GF, you will notice a lot of recipes all for a bazillion different GF flours (brown rice, white rice, sorghum, corn, tapioca, xanthum gum, and many more). Before you go and buy a bazillion flours and build new kitchen cabinets to store them in, try one of these all-purpose mixtures. the name 😉 Reward the companies that label their foods GF, stay away from the ones that aren’t labeled even if they seem GF– you never know. Processed meats are of course second to “real” foods but, hey, we all need a turkey sandwich sometimes. Don’t buy anything that is already moldy (some of the shelved GF breads sit there for a loooooong time). I’ve accidentally done this. Don’t buy any frozen items that may have been unfrozen, they tend to fall apart. 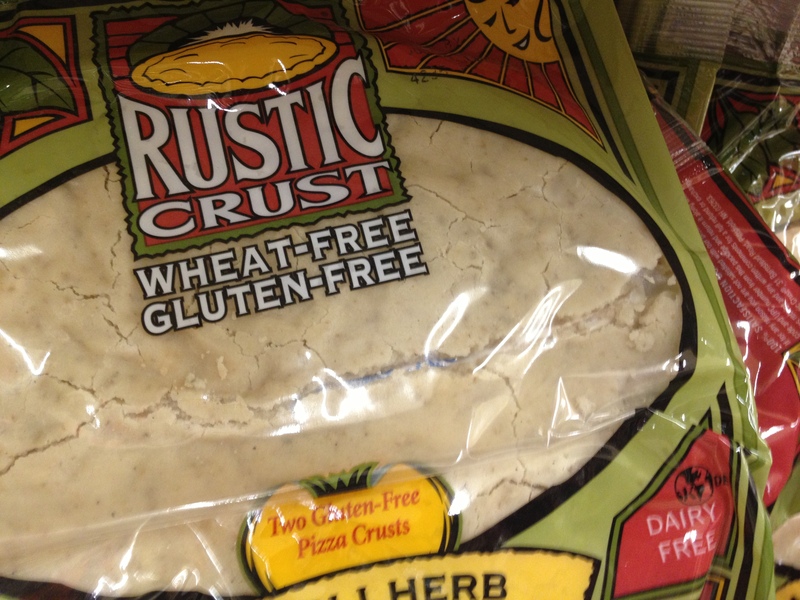 Don’t buy this pizza dough that is falling apart right on the shelf! This entry was posted in Burlington, Grocery Stores, Prepared foods and tagged Hannaford's, starting out on April 24, 2013 by gfvermont.